I slept badly the night before the race and woke up wracked with nerves, knowing that I had taken on a highly ambitious challenge that would test me to the limits. This year the legendary Man vs Horse event at Llanwrtyd Wells attracted a record entry of more than 300 individual runners, a large brigade of cavalry and many relay teams. Saturday dawned hot and dry, adding to my apprehension. Setting out a little late I was pursued to the race by a crazed woman in a black car – a member of the club, I wonder? As I had only previously done the final leg of the relay, choosing the right kit was a big decision. I felt somewhat over-kitted at the start with a “camel” backpack and a bumbag stuffed with various nutritious goodies. Was I carrying unnecessary weight or was I well-prepared given the conditions? Time would tell. Shod in my studded “mudclaw” cross country shoes I wondered whether I had chosen the appropriate footwear. A majority of runners appeared to have gone for cross-trainers or road shoes. It was a relief to get the race underway and I deliberately began near to the back and at a very sedate pace. This proved to be a very good decision. In fact I was overtaking people steadily throughout the entire race and I am hard pressed to think of more than 3 or 4 people that overtook me. For my money the first leg, though the shortest, is also the hardest, climbing over 1,000 feet over some difficult ground at times (Dave Ameghino took a nasty fall at 6 miles). I felt tired as the first checkpoint approached and genuinely considered whether I would be able to complete the course. I must have been tired during the second leg, since as I write this article I can hardly remember it! So to the third leg and my secret weapon – jelly babies! You can forget your gel bars and your energy drinks; I am convinced that these are the greatest of all dietary supplements. They must be, since I experienced a huge ‘second wind’ around the 16 mile stage as we climbed up through a long, narrow forestry track; suddenly running was easy and I covered more miles in the fourth hour of the race than in any of the previous three. There were some spectacular views as we ‘topped out’ for the last time at around 18 miles and began the descent towards the finish. And so to the results; I was unashamedly delighted to finish 120th out of 329 competitors and 5th Vet55 in 4:18, which bodes well for the Hereford Marathon in September. 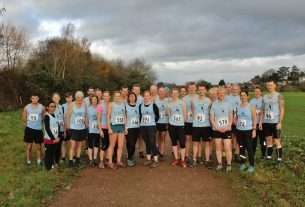 The contingent of individual Croft runners included Glyn Williams (62/3:55), Dave George (88, 4:08), Dave Ameghino (113, 4:17), Martin Williams who succumbed to cramp (126, 4:22) and Gary Gunner (160, 4:31). Total distance was 23.7 miles, with 3,834ft of climb. I do hope I haven’t missed anyone and I trust the relay team will post their own account. Intriguingly, the first female, finishing 8th overall in 3:07 was a certain Chrissie Wellington (Birmingham Running and Triathlon Club), surely not the legendary ‘ironwoman’ and one of our greatest ever athletes? If this is confirmed I shall dine out on it. Well done Neil, all Crofters who completed the full route and Jo who did an excellent relay leg at short notice! Just one leg of the relay was hard enough for me! Unfortunately you missed to mention our own true ‘ironman’, Gary Pearson, finished first Club runner in just over 3.30 . My abiding memory of Man versus Hoss was in 1989 being over taken in the last mile by the great Brian Davies with the inevitable comment ,” whats the matter with you boys that train then..?”. A classic. Well done Neil, thought you paced that one perfectly, hardest race I have ever done but I will have another go at it next year. Thanks to Tom Davies, who I ran with during the middle part of the race, kept me going. As for equipment, looking at Garry Pearson, who wasn’t even wearing a T shirt, I think we were all over kitted!. He had a few Jelly babies in his pocket and nothing else!